In this update blog, Gargi pulls from her final project report to explain many of the new alterations to the Safe Home and Outreach programs. You can read about some of the initial developments in her first guest post. The past month at TTL was all about changes. Target, Train, Track, Test - the 4 T's and public health mantra for implementing change - helped guide the recent programmatic developments. Of course, changes are not always welcome, but the case is different for TTL where staff welcome changes in the best interest of the children they serve. If public health experts have their 4 Ts, then TTL has its 4 Cs: Care, Connect, Change, Champion. We witnessed all of these in recent weeks. Often the only sign of severe acute malnutrition (SAM) in children is appetite loss or reduction. Their shrinking bodies experience a disruption in metabolism that interferes with their appetite, which may lead to further starvation and death. Fortunately, appetite loss is easy to identify. All it takes is a spoonful of peanut butter and a little patience. Using this basic appetite test, if the child eats a ‘good’ amount of peanut butter he or she passes the test and can be fed normally in the Safe Home. A failed appetite test indicates a need for more intensive medical therapy before 'food therapy,' and the child goes to the District Hospital with convincing evidence of metabolic distress. There he or she can receive appropriate medical support before returning to the Safe Home for round-the-clock care. The Safe Home Supervisor implemented this appetite last month and now uses it diligently for all incoming clients. As TTL staff had already received nutrition training, we determined which areas needed strengthening based on a role-specific assessment. 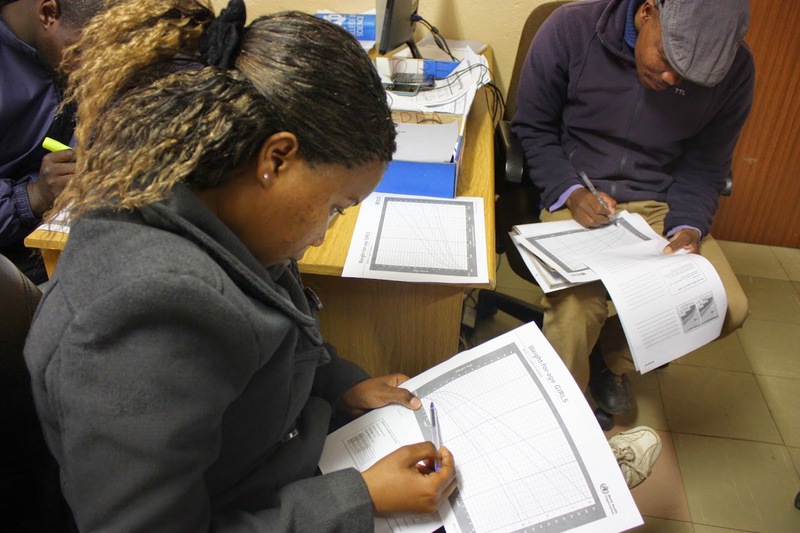 From their responses, Outreach staff were trained on using aids to counsel caregivers on child growth and development, and the Safe Home staff were introduced to an enhanced monitoring and evaluation (M&E) system for recording food intake and health danger signs. In the Outreach training we emphasized educating caregivers on the developmental milestones of child growth. With the help of counseling cards, Outreach staff learned to help caregivers assess whether their child’s development was on track and to provide examples of activities that support age-specific development. Everyone agreed that instead of discussing weights in arbitrary numbers, a visual aid (with spikes, plateaus, and dips in the child's weight) would aid discussion to identify episodes of illness or other reasons for the lack of weight gain. 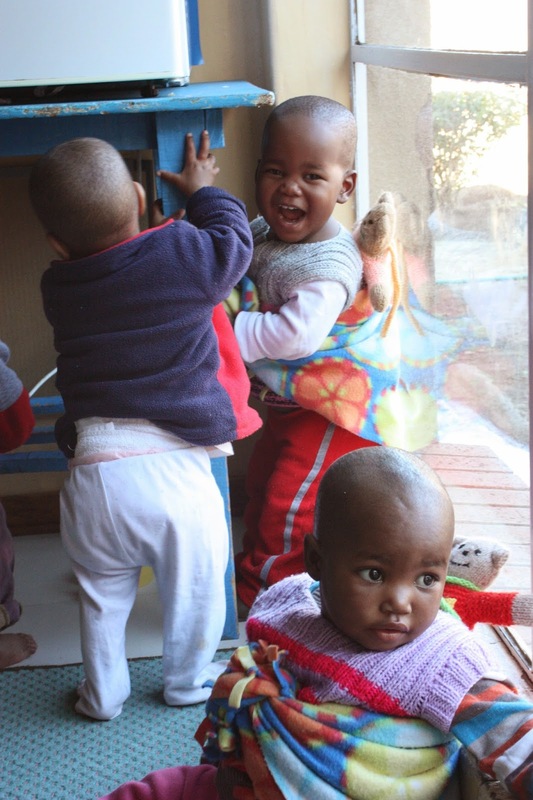 TTL staff could then tailor their counseling to address specific issues - whether diarrhea management, using TTL food parcels for optimum child feeding, or the importance of hygiene & sanitation. Eager to use the growth charts, some Outreach staff have started plotting weights of children in the Safe Home and are practicing their counseling skills on the Safe Home caregivers! For the Safe Home training we took a slightly different approach. 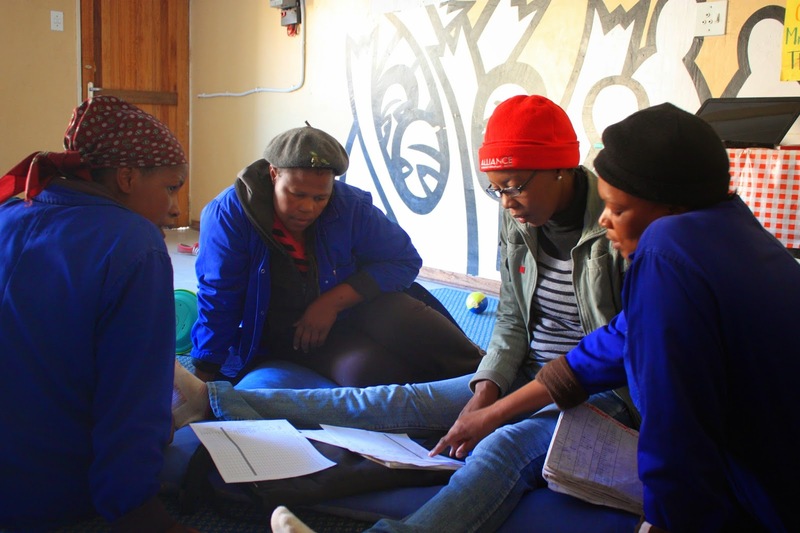 With the help of two Sesotho-speaking interns, we conducted a quick survey among the 13 caregivers to understand the difficulty and amount of time spent on record-keeping during day and night shifts. Overall, we found that Safe Home caregivers understood the importance of record-keeping and did not find it burdensome. They all reported that maintaining daily records, whether it was detailed observations of a client's behavior or noting every time a diaper was changed, was easy. The only time-consuming or difficult activities were feeding fussy eaters or attending the doctor’s questions during health check-ups. (Of course the favorite activity was playing with the kids!) Encouraged by the survey results, we then piloted new M&E forms to monitor individual food intake and health danger signs. In their monthly meeting, the caregivers discussed activities that some of them found difficult: for example, strategies to feed fussy eaters and time management tips to avoid wasteful activities. During this peer learning exercise, we oriented them to the new forms, which contain additional monitoring steps to provide more expert support to the Safe Home clients. The caregivers have already started charting individual food intake and health parameters flawlessly! They even reported that they now feel as knowledgeable as the hospital nurses. And should any problems arise, they know they can just ask each other for help. Guest post by Gargi Wable, Nutrition Consultant for TTLF, who recently finished up work for a TTL grant from UNICEF. Jasmine extract is actually a great tool in your skin care arsenal. This plant's oil contains antioxidants, which are known to not only condition the skin, but to also make it look healthier. Even dermatologists recommend this product to their patients.Keeping your skin clean is the most important step toward improving its overall condition. Just a daily face washing can go a long way toward preventing acne. You can save money, time and stress by doing your homework before purchasing skin care products. Sometimes, simpler and less expensive products are best. The best protection you can give your face from sun damage is to apply a moisturizer that not only moisturizes but that also contains a sunscreenExfoliating your skin on a regular basis helps you look radiant and younger. Use an exfoliating facial scrub and gently scrub your face. Exfoliate once a week for the most optimal results.